What is the UV Paqlite? The UV Paqlite (UV Pack Light) is the amazing reusable light designed to provide a night light illumination in an enclosed environment all night long. What's inside the vacuum pouch? 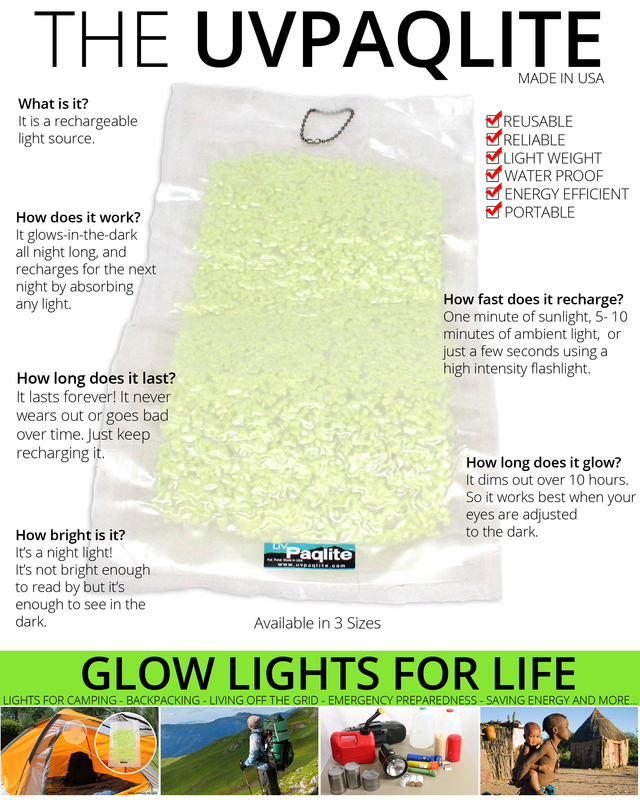 UV Paqlites contain exclusive glow in the dark crystals which are brighter, glow longer, and recharge faster than traditional glow in the dark items. What's the purpose of the vacuum pouch? 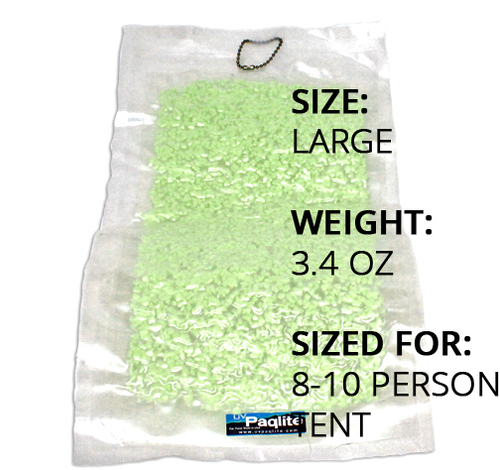 We use a vacuum pouch for several reasons: The vacuum pouch allows the crystals to be spread out over a large surface area which provides a lot of illumination in an enclosed environment. 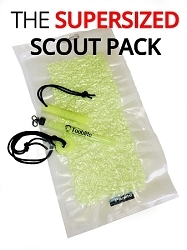 The vacuum pouch allows the UV Paqlite to be very lightweight, roll up, and pack easily into any gear bag. Lastly, the vacuum pouch waterproofs our crystals so there are no worries if the UV Paqlite is exposed to rain, snow, or even submerged in water. How do UV Paqlites charge? To charge the UV Paqlite just expose it to any light source: sunlight, ambient room lighting, flashlights, headlamps of vehicles (see below for recharging time estimates). When your eyes are fully adjusted to the darkness the large UVPaqlite provide a low-level night light illumination in an 8 - 10 person tent or small bedroom. They will provide a night light illumination for over 10 hours. The light dims over time so be sure your eyes are adjusted to the dark. 200 Lumen Flashlight = 2 Seconds. The UVPaqlite will last forever! UV Paqlite are unique they do not require batteries, bulbs, or chemical activation (shaking or breaking) therefore you can reuse them over-and-over again. 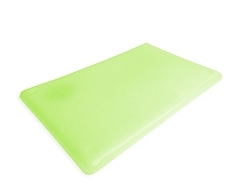 These glow-in-the-dark lights do not have a shelf-life so you can store them anywhere and for an extended period of time to use in case of an emergency. The UVPaqlite does not decay over time so it will work the same today as it will 50 years from now.